Canon's new PowerShot S330 "Digital ELPH" is the 2002 upgrade to the PowerShot S300 camera. It retains and improves upon the stylish and elegant design that made the S300 one of the most popular digital cameras of 2001. Packed inside of the highly compact and durable stainless steel case is a 3x optical 35-105mm f/2.7-4.7 zoom lens and a 2.0 megapixel CCD sensor. The menu interface and camera controls have been improved to make it easier to use. It features direct print capability with Canon's new CP-100 and CP-10 Card Photo Printers as well as the S820D Photo printer for making direct, borderless prints up to 8.5 x 11-inches without need of a computer. The S330 captures high-resolution still images up to 1600 x 1200 pixels for printing or you can select 1024 x 768 or 640 x 480 size for screen or web use. For creative control it has a Photo Effects mode; a shutter speed range of 15 seconds to 1/1500 second; spot metering; selectable ISO settings from 50 to 400; built-in red-eye reduction light-guide flash; and zoom playback up to 10x for convenient image review. A new Intelligent Orientation sensor has been added to both models to detect whether an image has been recorded horizontally or vertically. During image playback, the sensor detects the proper orientation of each image, and previews them accordingly without the need to rotate the camera for image viewing. It is also adjusts AF, AE and white balance accordingly. Similarly, when using the ZoomBrowser EX and ImageBrowser software included with the cameras, vertical and horizontal picture orientation is automatically detected and appropriately displayed. When powered down, the lens is safely tucked away inside of the highly durable stainless steel body that measures just 3.7 x 2.5 x 1.2 inches. This is truly a "pocket size" camera that weighs a scant 8.5 ounces. As with all the Canon compacts, the S330 has a light-assisted autofocus that even works in the dark. An advanced TTL AiAF three-point autofocus system permits the camera to automatically select the primary subject even when off-center. The PowerShot S330 can also record movies with sound in VGA (640 x 480 pixels), QVGA (320 x 240 pixels) and Q2VGA (160 x 120 pixels) at 20 frames per second. Up to 4 seconds of continuous recording is possible in VGA, 10 seconds in QVGA, and up to 30 seconds in the Q2VGA format. In addition, the PowerShot S330 features a built-in speaker for audio playback, as well as a Voice Memo feature that allows users to add up to 60 seconds of sound annotation to any captured image on the camera's CF card. The S330 comes with a comprehensive suite of programs enabling image management, editing, compositing and printing. It's compatible with both Mac and PC computers, including Windows XP and Mac OS X. Included is Apple QuickTime 5.0, Canon RemoteCapture 2.4, and PhotoStitch 3.1 for both Macintosh and Windows, as well as Canon ZoomBrowser EX 3.3, PhotoRecord 1.4 and WIA and TWAIN drivers for Windows, plus ImageBrowser 2.3 and a Photoshop-compatible plug-in for the Mac. Features integrated in both ZoomBrowser EX 3.3 and ImageBrowser 2.3 include TimeTunnel and SlideShowMaker. When using ZoomBrowser EX 3.3 or ImageBrowser 2.3, users can take advantage of new and improved features for auto layout printing, self-running full-screen slide shows, and automated preparation of images for use as e-mail attachments. The Canon PowerShot S330 Digital ELPH is available at retailers nationwide in March,2002, and has a suggested retail price of $399. 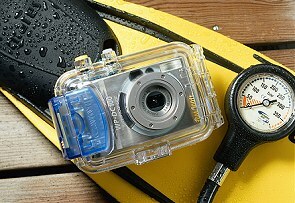 The optional WP-DC500 Waterproof Case for the S330 is rated for underwater use to a depth of 30 meters. It's also perfect for use when snow skiing or using the camera out in the rain or other inclement weather. The S330 compared to a normal CD disc. Shutter Speed : 15 - 1/1500 sec. * 1- 1/ 6 sec. possible at flash-off or slow-synchro in manual mode. * 15 - 1 sec. possible in long shutter mode. * Noise reduction processing on speeds between 15 - 1.3 sec. Self-Timer : Shoots after approx. 10 sec. or approx. 2 sec. My Camera Settings : Start-up image, Start-up sound, Shutter sound, Operation sound and Selftimer sound. Customizing is possible by downloading data from your computer using the supplied software. 3.7 x 2.5 x 1.2 in.